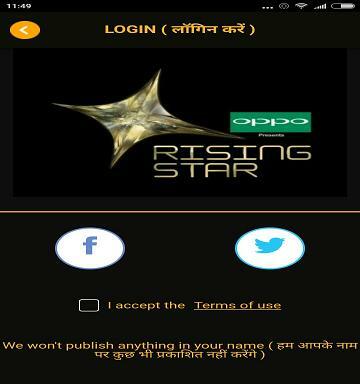 Rising Star is a reality television singing competition with a unique program format which lets viewers to vote for contestants via mobile apps. Viewers sitting at home can vote during each performance of this show. Here audience will act as fourth judge of this reality show with other experts. The audience at home is able to decide in real time whether or not a contestant is sent through to the next round by using a mobile voting app. But experts judges may influence the vote of viewers but with only a small percentage of the total voting power. Colors TV’ show Rising Star is an Indian version of the international franchise series Rising Star a reality television singing competition. It is based on the Israeli singing competition HaKokhav HaBa (meaning The Next Star) made by Keshet Broadcasting Ltd. 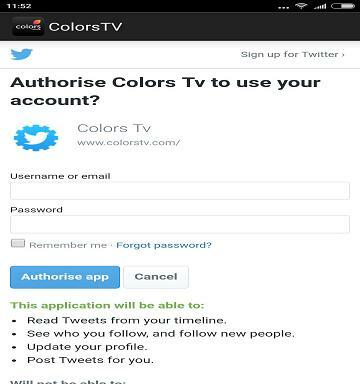 Here we have mentioned full steps of Colors TV app installation and voting. 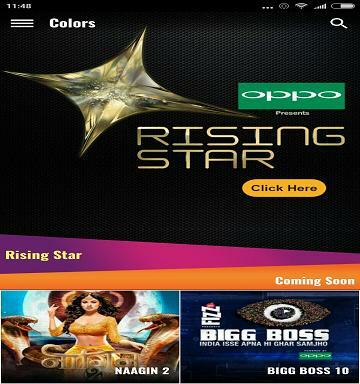 So download Colors TV App to Vote and be the 4th Judge of reality show Rising star 2017 Season 1. Open your Android smartphone and go to Play Store. Once it opens type colors tv in search box. Play store will search and present many result, look the below image and find same in search results. Probably first result will be Colors TV app. Once you find the ColorTV app click on that, It will take you to app installation window like below Image. Now click on Install button. Once you click on Install button, The installation of app will start which take some so have little bit patience. 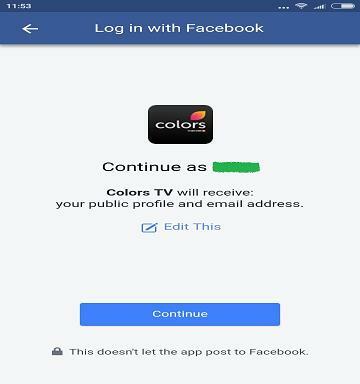 Click on open button after full installation of Colors TV app . Now your Colors TV app is ready for use. The below image is home page of app. If you select Facebook then below window will pop up, now click on continue button. If you select Twitter then below window will pop up, now provide you credentials and click on “Authorise app” button. This app shows many live serials and will be used for online voting. There are lots of bug. You can watch videos of your favorite shows whenever you want to watch. You can see what others in your area are viewing using the Map view and follow the schedule and set reminders for your favorite shows so that you don’t miss. But Still need lots of testing. This App is not working on some of smartphone models and crashing every time. It says not supported current display size and settings. You may face continuous crash issue. Some users reported that this App is not working properly for live voting. There is lots of connectivity issues even with 4G or broadband connection.